Northern Ireland boss Michael O'Neill has agreed terms for a lucrative new four-year contract after his side reached the Euro 2016 finals. The Irish FA deal is said to be worth £500,000 a year, the Belfast Telegraph newspaper reported on Tuesday. That would make 46-year-old O'Neill the highest-paid manager in Northern Ireland's history. In June, Northern Ireland will play in the final stages of a major tournament for the first time since 1986. Last October, O'Neill told BBC Sport his preference was for a four-year deal, rather than the IFA's usual two-year policy. 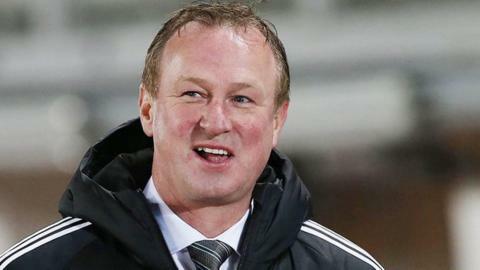 A well-placed source told BBC Sport Northern Ireland that O'Neill's contract extension is "now effectively a done deal". The contract extension, which will begin after Euro 2016, will include a release clause which would allow see the IFA being entitled to compensation if O'Neill was to be lured into club management. O'Neill's side won their qualifying group, finishing ahead of Romania and Hungary. The team won six and lost one of their 10 games. They will face matches against Poland, Ukraine and Germany at the finals in France, with the first match on 12 June. O'Neill became Northern Ireland manager in December 2011 after taking League of Ireland club Shamrock Rovers to the Europa League group stages. In December, the former international midfielder was named coach of the year at the BBC Sports Personality Of The Year ceremony. O'Neill's new contract is expected to include a clause guaranteeing the Irish FA compensation if he leaves to take up a club post.